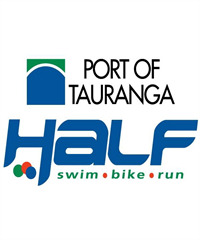 The Port of Tauranga Half is the country's premier Half Iron distance event and certainly one of the most popular races on the New Zealand racing calendar; with entries selling out in previous years. The event is popular with beginners of all ages, shapes and sizes through to the world class elite, and is accredited by Triathlon New Zealand and doubles as the National Long Distance Triathlon Championships. The best of the best in elite and age group categories race for national titles and the chance to gain selection into the New Zealand Long Distance Triathlon Team. The event is held the first Saturday after New Year weekend each year, and recieves significant media coverage with a backdrop that includes some of the finest tracks, beaches and properties in the Bay of Plenty region.